Favorite style(s) to play: When I'm a listener, I enjoy a wide variety of music. 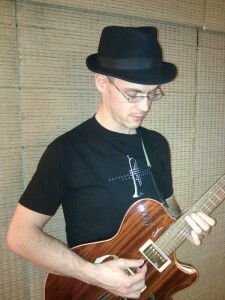 When I'm playing guitar though, I get the most enjoyment out of improvisational styles. For the moment, that has me focusing mostly on blues. I still play a bit of classical and Spanish repertoire music, and dabble in other styles occasionally. When my playing skills have developed more, I would like to be more versatile and branch out into other styles. What made you want to play music? There wasn't a single defining inspirational moment that made me want to play guitar. I've always loved music and wanted to play a part in making it myself. When I listen to music, the guitar parts are what jump out at me most, so guitar was a natural choice for me. Previous music experience: I had some band class and choir experience from my early school years. Like many people, I had also made numerous halfhearted attempts to learn the guitar myself, getting nowhere. My most significant experience prior to Learn & Master Guitar was that I had been taking classical guitar lessons for a few years. This got me off to a head start on the basic lessons on reading music, the notes on the guitar, and of course the fingerstyle lesson. I'm sure it also helped with general finger strength and dexterity. After that though, using a pick, strumming, soloing, and playing blues/jazz/rock, etc were quite new to me and I had to work on it a lot just like everyone else. If your house was on fire, which instrument would you grab? I'd grab my travel guitar. It's not my best or most expensive guitar, but I keep learning resources, music, portable speakers, headphones, etc in its gig bag, so I'd be able to continue playing and practicing just with that. What is your favorite place to be when playing guitar? I have a "guitar nook" in my condo where I play most often, but that's just because all my gear tends to be there. For practice, any comfortable and distraction free place will do. Aside from that, the music I'm playing, who I'm playing with and who I'm playing for are much more important to me than where I'm playing. What has been your highest, most delightful musical moment so far? While at my parents' house for Christmas 2010, I was playing holiday music on my travel guitar. My baby nephew had been crying, but when I started playing Silent Night, he calmed down and started to sleep. If I stopped playing, or started playing a different song, he would begin to stir, so my sister had me on repeat! I lost track of how many repeats I did, but it was well worth it. I've played better and had larger audiences, but my music has never had a bigger impact on other people, so that moment is quite special to me. Hobbies: Most of my spare time centers around guitar and cycling/running/triathlon. I do still find time for a lot of other things though: chess, golf, movies, programming, reading, snowboarding, tennis, etc. Current Job: Software Engineer at a small company.